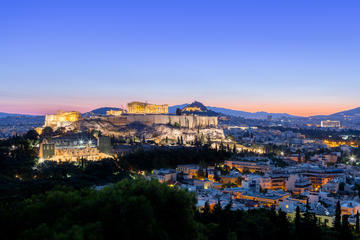 ​​Dionyssiou Aeropagitou pedestrian street is one of the most impressive streets of Athens, if not the world, offering an extraordinary view of the southern slope of the Acropolis, where some of the city’s most significant monuments stand, along with the Parthenon itself. But who, one may wonder, was this important man, to whom the city of Athens dedicated this magnificent street? Dionyssios, a member of the justice court, thus an Areopagitis, was the first Greek official to convert to Christianity during St. Paul the Apostle' visit to Athens in 52 A.D. He later served as Bishop of Athens and died in martyrdom. The Christians honor him, and have also dedicated the city itself to him. For us at The Athens Key, however, the eternal protector of this glorious city was, and remains to be, Athena, the goddess of wisdom, daughter of Zeus! ​Most of the buildings on one side of the road facing south were constructed in the late 19th century and the early 20th century in the neoclassical or modernist style, reflecting the aristocratic style of the street. ​​Dionyssiou Areopagitou pedestrian street begins at the intersection with Amalias Avenue, across from the site of the Temple of Olympian Zeus, where the marble bust of Melina Merkouri can be seen, and extends, after passing the entrance to the Acropolis Museum, to the entrance of the Herodeon, the access paths towards the Acropolis and, finally, the intersection with Apostolou Pavlou pedestrian street, the Pikionis marble-paved pedestrian walk towards the Philopappos Monument, the church of Agios Demetrios Loumbardiaris or Koili Odos, and to the sharp left, towards Hatzichristou Street. ​​You may want to follow our walk around the Acropolis, through a series of photographs I have taken over the last few months, often again and again, since this is the neighborhood I was born in, and decades later moved back to... The Athens Key would like to extend a warm welcome to AthensWas Hotel on 5, Dionyssiou Areopagitou Street, managed by Anemi Hotels.​ For your outdoor sports activities, including running the Areopagitou pedestrian street, check out our selections on Activewear!